The author, inspired by Thich Nhat Hanh’s walking and breathing meditations, combines “seed-verses” from Quaker and Biblical writings with exercises for meditative walking. 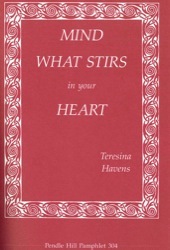 Teresina Havens (1909-1992) lived a life deeply engaged in religious education. Her academic background and teaching took her from initial studies in comparative religion at Smith College, the University of London and Yale University to her later work as a professor at Carleton, Beloit, Springfield, Westfield State College and the University of Massachusetts. Her educational work did not end in the secular environment of the university, however; she also taught at Pendle Hill and Temenos, an intentional religious community that she started in Western Massachusetts. On a research trip to Japan connected with her job at Carleton College, Teresina Havens discovered Itto En, a Buddhist and Christian community in that country. A conversion experience at that monastery began a spiritual journey that led her to Pendle Hill in 1942. While teaching at Pendle Hill, she followed a leading to join the Religious Society of Friends. Following her conversion, she began a social justice ministry, living in a racially segregated neighborhood of Chester, Pennsylvania. Buddhist practice helped Teresina Havens to interpret Quakerism. In addition to her commitment to the social justice testimony, she practiced Quakerism with an eye towards keeping her mind and body in tune. In her understanding, Isaac Penington’s advice on prayer, “to breathe in the Heart of the Lord,” referred to literal breath as well as figurative breath.